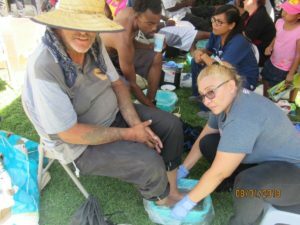 Azusa Pacific University (APU) Nursing students from the High Desert Regional Campus partnered with the Salvation Army to host the fourth annual Socks, Shoes and Salvation Homeless Foot Washing Event in Victorville, CA. More than 250 community members, many of whom are homeless, turned out to have their physical and spiritual needs met. “We are so pleased with how this event has come to fruition. It is one of the most humbling and rewarding experiences for our students,” said Nicky Campbell, Program Representative from APU High Desert Regional Campus. Four years ago, APU Lead Nursing Instructor Lydia Garcia-Usry had a vision for the event. “I presented the idea to a group of nursing students of what we call cohort 12 and they ran with it. They were on the streets and the riverbed in Victorville, making this happen,” Said Garcia-Usry. 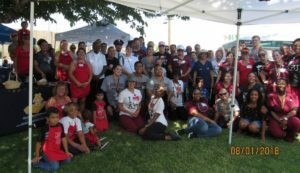 Volunteers from nearly a dozen local agencies participated in the outreach, including God’s Hand Extended, Rose of Sharon, High Desert Second Chance, Community Health Action Network, Choice Medical Group, Victor Valley Rescue Mission and others. God’s Hand Extended volunteers passed out hygiene packages, T-shirts, water, umbrellas, sunscreen and homeless resource guides. The guides are made available by HOPE team—Homeless Outreach Proactive Enforcement from San Bernardino County which gives information like temporary/transitional assistance, counseling and mental health service, substance abuse, domestic violence, Veteran services and more. “Many guests were thankful for the resource guides. Because of this event, we were able to spend one-on-one time with them. The event was well organized, and they felt truly cared for,” said Founder of God’s Hand Extended, Susan Padilla-Conway. According to Garcia-Usry, well over 400 pairs of shoes and 700 pairs of socks were donated by several nonprofits and individuals. Debbie Lemon, Rose of Sharon Director and Public Relation Specialist Laura Foss handed out resources for mothers in need of diapers, formula, and clothing, including an 8-month pregnant homeless woman. Other agencies at the outreach include St. Joseph Health, St. Mary, Agape, Victor Valley Global Medical Center Outreach, Pre-School Service-Head Start and the San Bernardino County Tobacco Control Program and Department of Public Health. Victorville Mayor Gloria Garcia and Representatives from the offices of State Sen. Scott Wilk and Assemblyman Jay Obernolte were also in attendance. “You could feel the Jesus love all day. The guests left feeling loved and hopeful,” said Susan Padilla-Conway. For more information on further outreaches, contact Lydia Garcia-Usry at lgarciausry@apu.edu.